Blazers really are so versatile. I mean, come on. Not only for business attire, but with skirts, shorts, denim- but this outfit of the day look is rocking distressed denim! 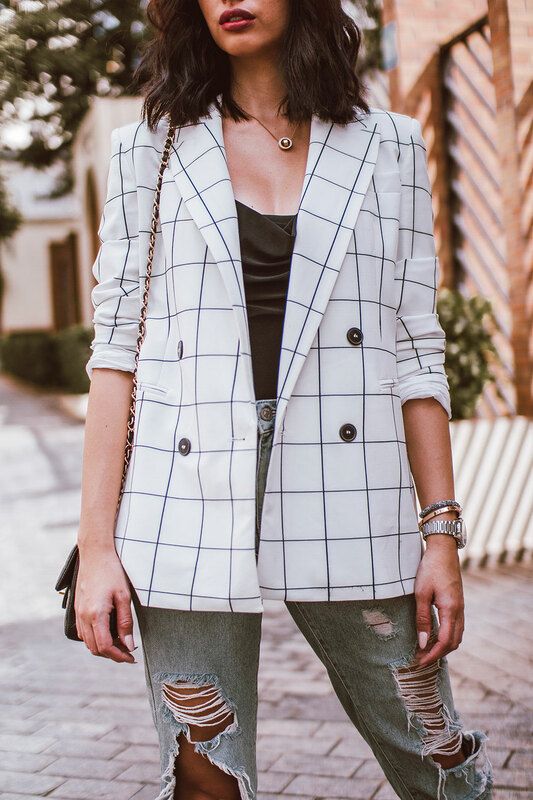 First thing first, this white plaid blazer. I got this beauty is from Zara. It’s laced with black plaid stripes, which give it some edge and character. Nice big buttons up and down the front of it, and traditional lapels. I rolled the sleeves up to be 3/4, which help make it less business and more casual. Beneath the blazer is a black top from Fashionnova. It slouches in the front giving it a feminine neckline that helps counter any boxy-ness (yep, boxy-ness), and is tucked into some high waist jeans. These acids washed distressed mom jeans are awesome. Distressed denim shows up in fashion in waves every few years, and this year? They’re hot. I picked up these bad boys from H&M. You guys, I cannot stress enough how easy it is to add color accents into looks! I’m wearing red pumps from Santa Lolla. They add a vibrant pop to the rest of the outfit, which is cute on its own, but the red addition to the black/white/denim gives it the “wow!” factor. Accessorized with a black Chanel bag that has metal accents and some Swarovski jewelry, this look is ready to hit the streets! Next PostNext Fall Boot Guide: Everything You Need to Know! I loved babe, you’re so pretty ❤ I loved this OOTD but wanted more details him.